Volunteers will soon be setting fences, erecting tent covers and signage for seven acres of land and eleven structures , hauling provisions for the one hundred plus Civil War reenactors, sprucing up their period costumes, and turning the clocks back 150 years in final preparations for the 21st Annual Peterboro Civil War Weekend. The weekend event begins at 10 a.m. on Saturday June 8, and ends at 4 p.m. on Sunday, June 9 with Taps, written by Oliver Wilcox Norton, best friend of Alexander Dickey of Siloam, Town of Smithfield. Dickey and Norton had agreed to inform each other’s family if either was wounded or died. Norton had the sad task of coming to Dickey’s burial in Siloam having died in 1864 from wounds at Darbytown Road, Virginia. The Civil War military and civilian encampment includes daily life and housekeeping, drilling, medical tents, generals plotting strategies, President Lincoln walking about pressing copper coins in the palms of tots, Civil War Round Tables, historical organizations, vendors and sutlers and, of course, the skirmish at 2 p.m. each day. The hamlet will welcome folks from neighboring towns and several states who will become immersed in 1863 as the event recognizes the Sesquicentennial of the Civil War with featured themes of the Emancipation Proclamation, the recruitment and service of the United States Colored Troops, and the Battle of Gettysburg and President Lincoln’s famous speech five months later. 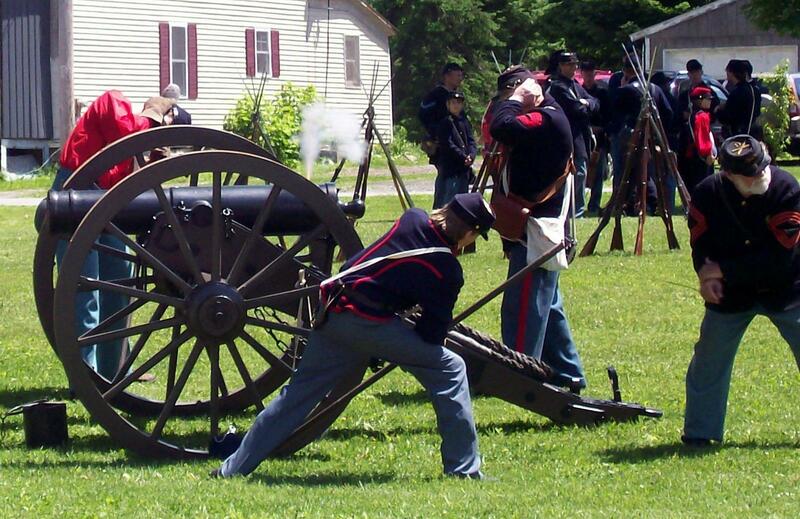 The community of the Town of Smithfield and the dedicated reenactors create a 19th Century village in which families can spend the weekend doing a variety of activities. The best introduction to the hamlet is a tour at mid-day both days of the weekend that begins at the Iron Gate with guides Donna Dorrance Burdick (the Town of Smithfield historian) and Beth Dorrance Spokowsky (the President of the Peterboro Area Museum.) Walking slowly and talking fast the two sisters provide an entertaining and educational crash course in Peterboro history. The guides begin with details on the lives of Peter Smith and his son Gerrit. The tour will continue on the west end of Park Street, where participants can expect to be introduced to a re-enactor portraying Elizabeth Smith Miller, wearing her creation-the bloomer costume. Proceeding down Park Street, visitors will learn about the activities held on the village green in years past, as well as the various residents of the houses along the way. The two can also be found much of the weekend at the Peterboro Area Museum with the exhibits of Peterboro and Its People, and, Burdick’s displays on Smithfield in the Civil War and the war experiences of Aaron Bliss who was in five prison camps before escaping, becoming Governor of Michigan, and donating the Civil War statue to his hometown of Peterboro. To learn about Peterboro’s famous citizen Gerrit Smith, visitors can visit the Gerrit Smith Estate National Historic Landmark across the street from the Civil War encampment. Exhibitions (including an introductory video) for The Barn, The Grounds, The Land Office, The Laundry, and The Lodge describe Smith and his family, Smith’s use of wealth to aid the oppressed, his abolition activities, his Underground Railroad activities at the site, African-Americans in Peterboro. The Lodge will also have binders and videos from twenty years of Civil War Weekend. These exhibits are open the hours of the annual event, as is the Peterboro Mercantile, the community heritage shop. &#8211 which has a satellite station on the green. With a walk a few hundred yards up Pleasant Valley Road visitors can learn about the haven that Gerrit Smith and Peterboro provided to abolitionists mobbed in Utica trying to establish an antislavery society for New York State. The Smithfield Community Center is the municipal building for the Town of Smithfield and also the home of the National Abolition Hall of Fame and Museum (NAHOF). An introductory video on the 1835 NYS Antislavery Society, exhibits on the history of American Abolition, a facsimile of Lincoln’s Preliminary Emancipation Proclamation won by Gerrit Smith, and banners for inducted abolitionists are among the points of interest at NAHOF. At 7:30 p.m. Saturday, June 8, the 77th New York Regimental Balladeers will present a one act play &#8220Dear Friend Amelia&#8221 with music and songs at the Smithfield Community Center. The director of the 77th Balladeers John Quinn wrote the original song Amelia with John Kenosian. Narrated by John Quinn, Maxine Getty, and Melanie Martin, the play will feature Alexander Stowe as Private John Tidd and Jody Luce as Amelia Haskell. The letter exchange shows Tidd’s changing thoughts on the war. The play was written by Mary Jordan and Joyce Hatch using letters sent by John to Amelia during the Civil War. Haskell and Tidd were residents of Speedsville in the Southern Tier of New York State. The 77th Balladeers will also present Civil War musical programs at 1 and 3 p.m. on Saturday. Admission is $10 at the door. A United State Postal Service postal cancellation and cachet on Saturday at the General Store on the green will recognize the United States Colored Troops and Lincoln’s Preliminary Emancipation Proclamation, which was owned by Gerrit Smith of Peterboro. The General Store will also carry an abundance of Civil War and other historical items. A Civil War sword made for Gods and Generals will be available for silent auction. A chair caned and donated by Lisa Gardinier will be available by raffle at the store. On Saturday at noon the Smithfield Volunteer Fire Department will start serving BBQ Chicken at the Firehouse until the chicks are gone. On Sunday from 7:00 to 10:00 am the Peterboro United Methodist Church will serve pancake breakfasts at the Smithfield Community Center. The Church will sell a selection of cookies, lemonade, iced tea, and coffee at the Community Center from 10 am &#8211 5 p.m. at the same time of the United States Colored Troop Institute Exhibit. Vendors on the green will be offering ice cream, kettle corn, and other tasty treats. The Deli on the Green will be open both days offering a host of breakfasts, lunches and supply foods. Admission ($7 Adults $3 ages 6-12, Free under 6) covers event activities. For more information call 315-280-8828 or visit civilwarweekend.sca-peterboro.org/ on the web. Best of luck this weekend from my home near Peterborough, Ontario – wish I could be there. My just released book – Blood and Daring: How Canada Fought the American Civil War and Forged a Nation has a chapter on New Yorker William Seward and deals a lot with the state’s contributions to the war. Best of luck to you all.